Hard Tooling – Special Applications – AmeriKen Online! AmeriKen helps you solve special application problems with precision tooled custom punches that give you sharper cuts, cleaner ejection and superior wear resistance. 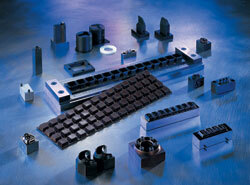 Special application punches are available with replaceable segments. Stop rails prevent damage to the tools from overcutting. Punches can be manufactured with special bases so that rule can be wrapped around the perimeter and then inserted into the die, eliminating the problem of board fracture by tight punch proximity. Simply send us your material and a description of your goal. List the job requirements. Your communication with our engineers is essential. After this pre-qualification process, our engineers will take it from there to supply you with the most effective method for cutting your parts. Your special application punch will be designed so it reduces set up time. The tooling will be useable with any type of press, even a hand press.